Because this site has a truly global audience, you the reader could be anywhere in the world. Were I to ask you where on Earth you are, you might volunteer the name of a city, a state, or perhaps just the country you’re in. The answer might be ambiguous – is that Paris, France or Paris, Texas? Modern geolocation applications use latitude and longitude to identify the location of people and of places to within a few meters, but it’s highly unlikely you’ll answered the question with those. Geolocation – that is, obtaining your location using GPS, Wi-Fi triangulation, or perhaps using your IP address – is all very well and good, but sometimes you just need to ask someone where they are. The challenge then is to do two things: work out what place you could be talking about, disambiguate if necessary, and then identify exactly where on Earth that is. That’s what I’ll show you how to do in this article; by using a freely available web service, we’ll write a simple program to ask users where they are (and ask them to clarify if necessary) before identifying their responses in concrete terms. I used the phrase “where on Earth” very deliberately as there is a database where places are identified not by name, but by what are called Where on Earth Identifiers (WOEIDs). The WOEID database has been put together and made freely available by Yahoo!, and is also used by Flickr, and for geographic-based trends by Twitter. With every entry is a latitude and longitude for that place, as well as the names people have given them. To complicate this somewhat, there’s not always a one-to-one relationship. What I call Brussels you may call Bruselas, while residents would be more likely to call it Bruxelles. Then there are special cases, such as Peking/Beijing. Yahoo!’s Placemaker web service is a “geo-extraction” service which uses the WOEID database and performs the sort of interpretation we need; parsing free-form text, identifying possible places, and returning information about them, such as the WOEID and that all-important latitude and longitude. Most of the form should be self-explanatory – under Authentication method, tick “Generic, No user authentication required”, as all you need to use the service is the application ID provided on the next page. Make a note of this application ID as you’ll need it in a moment (although you can always view your existing application IDs from the developers area). 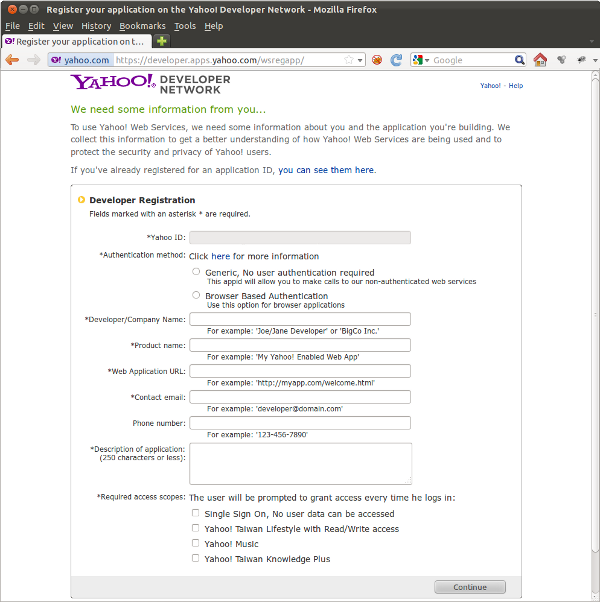 Placemaker is a REST-like web service with a single endpoint; to use the service you issue a POST request to the URL http://wherein.yahooapis.com/v1/document. There are a number of available response types: as well as the standard XML and JSON (and JSONP), you also have the option of obtaining the results in RSS format. Although I normally prefer JSON (a purely personal preference), in this example I’ll use XML. 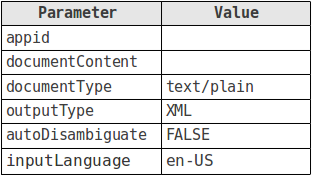 Let’s look at the five request parameters you’re going to use. The first, appid, is the application ID you obtained earlier. If you leave this out the request will be rejected. The second, documentContent, will be the string you’re searching for – the parameter named such because the service allows the parsing of entire documents, however I’m really just going to pass the name of a place provided by the user. Setting autoDisambiguate false overrides the default behavior of the service, which is to only return the most likely place. It’s this ambiguity we’re looking to resolve ourselves by asking the user rather than letting the service decide for us. Finally inputLanguage tells the service which language the document (that is to say, the user input) is in; this helps the service to know how to interpret place names. It’s not a required parameter (and predictably it defaults to US English), but it’s worth mentioning because it’s important to remember that a single WOEID can correspond to a number of names in a multitude of languages. Now let’s dig into the code then as we start by obtaining the text from the user via POST and make the request. I assume you’ve already implemented a form to capture the name and I’m also leaving out things like escaping input for the sake of brevity. The code simply uses cURL to set the endpoint to http://wherein.yahooapis.com/v1/document, the POST variables to those discussed earlier, and return the web service’s response as a string. Don’t forget to URL encode the name before passing it via POST though. When you tell the service not to disambiguate the results of the search, the response contains two aspects: the scope of the place that best describes the document, and the places the document could refer to. In other words, the service provides a best guess and gives you further information about that place within the administrativeScope, geographicScope, localscopes, and extents elements. Let’s look at the contents of the placeDetails element. The placeId represents a given place within the context of the response, and can be used to disambiguate between multiple matches with the same WOEID, although that – along with the placeReferenceIds – is a little beyond the scope of this article. The weight and confidence tell us more about the match. The weight refers to the relative weight of the place in the document as a whole. This is largely irrelevant in the context of our use of the service, as we’re only sending a fragment of text referring to a single place (at least that’s what we’re asking the user for). Rather, the is used to rank places when a number are mentioned, determined by such factors as their position in the document and the number of mentions. The confidence value (on a scale of 1-10 with 10 being the most certain) is the confidence that this place is actually referred to in the document – but also how confident it is that the place is referred to rather than another place. This last clause is important, because it takes into account the relative likelihood that if 100 people said “London”, the chances are that the majority would mean the capital of England, rather than one of the various, smaller Londons in the United States. In other words, we can sort the results in descending order, based on the value of the confidence. Finally, and most importantly, there’s the actual place. The place element has a type; this will usually be Town, but may also be State, Suburb or of course Country. The centroid element contains the latitude and longitude of the geometric center, name should be self explanatory, and woeId is the identifier I’ve been talking about. Because this is a widely accepted identifier, there’s nothing to stop us using this to obtain information about the place elsewhere. The code above uses SimpleXML to parse the response, iterating through the placeDetail elements. Each time it encounters one, it takes the place and centroid elements to extract the information we’re after, all of which is assigned to a new object representing the place in question. We should be left with an array of places, sorted in descending order of confidence. I’ve shown you how to ask the user for a place name, retrieved information about possible options and sorted them according to how likely they mean one location over the other, and a simple demo is available which you can find on GitHub. What you do with this now is up to you – you could ask the user for clarification, or try to reduce the number of alternatives using biasing. Some queries can produce dozens of results, so it’s probably worth trying to influence the search by biasing it towards a given location based on what you know about the user – you can pass the WOEID of a place using the focusWoeId parameter for just that. You may wish to read more about WOEIDs, or dig a little deeper by looking at Yahoo!’s Geoplanet service – not just for towns and cities, but landmarks as well. You may also wish to process whole documents – imagine for a moment the possibilities for geotagging blog content, or enhancing a text-based search to find documents not based on text content, but on the location of the user. Have a look through the documentation, play around, and if you get stuck there’s a Placemaker forum on Yahoo! where you can find further information and ask for help. If you do build anything interesting using this, I’d love to hear about it in the comments!